The front entrance road leads you to The Links golf course or to LE homes. Visitors can lodge at Land's End. Call 903-383-3290 for more info. The waterfall next to the Links swimming pool. Land's End wild flowers during the spring. Residents occupy large lake front and golf course lots. Golf at The Links during the fall and winter months on the Links. Residents can step outside to enjoy a spectacular golf course. Common areas are well maintained for residents and visitors. Fishing is great at Lake Fork. Residents at Land's End can own a private dock on Lake Fork. Click here to contact the HOA Board via email. Welcome to the Land’s End Homeowners Association website. The Land’s End Community is located on the shoreline of Lake Fork, near Yantis, Texas. The community consists of 126 residential lots (79 lake lots, 45 golf lots, 10 villa lots) that are adjacent to The Links of Land’s End golf course and the shore line of Lake Fork. Currently there are 90 homes in the community. Click one of the following links for: Directions from Quitman, Tx or Directions from Emory, Tx. Updates, HOA news, events and more. Enter your email address below. You'll get an email when a new article is posted. The 2017 Annual Meeting of Members will be held on Saturday, February 4th with a reception beginning at 2:00 and the meeting at 3:00 p.m. in the Community Center at the Land’s End Voluntary Fire Department. Click on: Notice of Annual Meeting to view details related to election of two Directors, a proposed Bylaw change, and the meeting agenda. A LE Owner Info Form link is also provided to view and print the Land’s End Property Owner Information 2017 form. This form is used to update property and emergency contact information for each lot owner. When completed it should be sent to Sharon Brooks. The link is also available in the list of Quick Links on the left side of the Home page of the website. 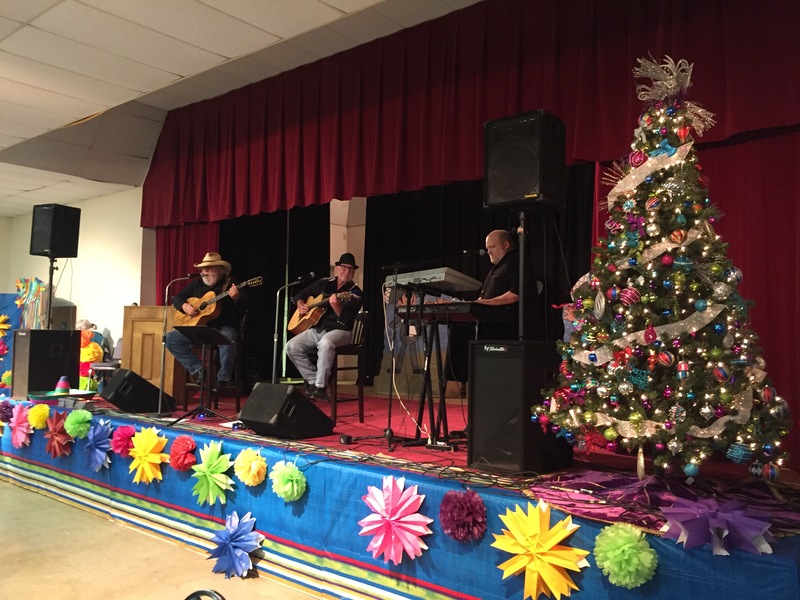 The Pilot Club of Quitman hosted a Fiesta Extravaganza event in Quitman, November 16. The event included a Mexican buffet dinner and the award of 7 Bucket Raffle Packages to winners who purchased raffle tickets. Former members of the 1980’s country band, “Mason Dixon” provided the musical entertainment. Land’s End residents who contributed to the event included Debbie Keenan, Vanita Plumlee, Carol Manning, and Sharon Brooks. Terry “Caz” Casburn (center of photo) was a member of the entertainment group, that also included Frank Martin Gilligan and Terry Bayless, on the keyboard. The Links at Land’s End, along with John & Barbara Macatee were two of the eleven local sponsors who also contributed to the event, that was a huge success. The Recycle Center, located on the parking lot of the Fire Station, will change, effective July 28, 2016. The Newspaper, Aluminum Can, and Plastic Bottle bins are closed, and used for other purposes by the Fire Department. The Cardboard bin will remain open for daily disposal of flattened cardboard items. The Upper Sabine Valley Solid Waste Management District–USVSWMD–(the company that currently picks up the recyclables) will no longer pick up newspapers, plastic bottles, and aluminum cans that have been separately placed in blue plastic recycling bags. If you would like to recycle, you may drop off your separated items (in blue bags) at the landfill in Yantis, located at 1216 CR 1912, Tuesday-Saturday 9:00-5:00. In addition to the usual items, they will take hardback books with the covers removed, metal the size of a ceiling fan or larger, and motor or hydraulic oil. You have to unload your items yourself. You can also bring your items to USVSWMD, located in Quitman at 111 Westside Dr. every day of the week from 6am-7pm. Effective April, 2016 Doug Hill and Bill Russell have replaced Tom Keenan and Brad McCampbell as members of the Land’s End HOA Board. Purchase of The Links at Land’s End by the club member group was completed on March 1, 2016. The 2016 annual meeting of the Land’s End Homeowners Association was held February 6, 2016. Minutes of the meeting are provided in the Annual H.O.A. Meeting post located in the Home page. It was reported that there are now 83 homes, with 54 full time residents at Land’s End. Other topics discussed at the meeting were the recent purchase of The Links at Land’s End by a group of club members, and the election of Rich Schmalz, Jim Parker, and Drew Roberts as HOA board directors, that now also includes Tom Keenan and Brad McCampbell. The Fire Department Chief of the Land’s End Voluntary Fire Department, Rick Nichols also provided an update on the Fire Department. Information related to the Ladies Luncheons, and the upcoming 2018 Annual Membership Meeting. Tom Keenan presented a summary of the improvements to The Links golf course during 2016 and plans for 2017 at the 2017 HOA membership meeting. We might not realize much of what Jacky Cupit accomplished before he joined us. Lake Fork is well known as the Big Bass Capital of Texas, as it's one of the 10 largest lakes in the state. Completed in 1980, Lake Fork was designed from the start to be a premier bass fishing lake. Land’s End is home to a variety of birds, including bald eagles. There’s an abundance of whitetail deer that freely roam our neighborhood. Land’s End truly is a natural paradise. At the Links, you’ll find 18 exciting holes that meander through the neighborhood and onto a long peninsula extending out into Lake Fork, with 11 holes located right along the shoreline. The VFD can quickly respond to 911 calls with fire prevention, fire protection, rescue or medical calls. For a rural community, this is an added benefit that you won't find anywhere else on the Lake.